WHEN Chito Narvasa delivered his first speech as commissioner before the PBA Press Corps at the latter's awards night on Wednesday, he gave a veritable lecture on “responsible journalism” before league beat writers and senior editors, some of whom were sportswriters even before the PBA was an idea. Two days later, Narvasa revealed why the big lecture: He banned television host and Spin.ph contributing writer Snow Badua from PBA games and all league activities. He also ordered all players, coaches, and officials, under threat of penalty, not to talk to Badua, as punishment for what he called Badua's “irresponsible and deplorable actions” against Ginebra governor Alfrancis Chua. But as facts and circumstances show, all is not what it seems. The circumstances that led to the ban reveal an underlying mindset that should alarm, not just Spin.ph, but every single media entity whose job is to cover the PBA. The timing of the ban itself is dubious. A top PBA official had warned us that the league board agreed to take action against Badua on Friday — the day Spin.ph ran a story about model Abby Poblador's confession, in a popular radio show, of her alleged affair with Chua, and a good two days before Badua posted the tweets that have been made grounds for his ban. Despite the warnings, we ran a second story on Monday culled from Badua's interview with the radio show's host, Mo Twister, confirming that Poblador mentioned Chua's name “like 15 times” during her “confession” of an affair. The ban was handed down by Narvasa on Friday. It must be said that Spin.ph is an independent and legitimate sports website covering, among others, the PBA, its activities, and its officials. This website is co-owned by GMA's New Media Inc. and Summit Media Inc., themselves long-standing media companies. As a media platform, Spin.ph does not seek to besmirch the reputation of any institution or person, but neither does it shirk from asking anyone the tough questions. To merge two apt clichés: we do not have an ax to grind but neither do we have sacred cows. In the end, what we do is simply give our readers the answers they deserve, as all media entities must. Why did Badua get the PBA's goat? A PBA official, requesting anonymity, intimated that some team officials present in that board meeting were fed up with articles that Spin.ph has dared run in the past. These presumably include the “farm teams” issue and game-fixing in the league, which we did run, precisely to give the professional teams a chance to air their side and address accusations constantly thrown at them by fans online. So why did we run the Chua story? 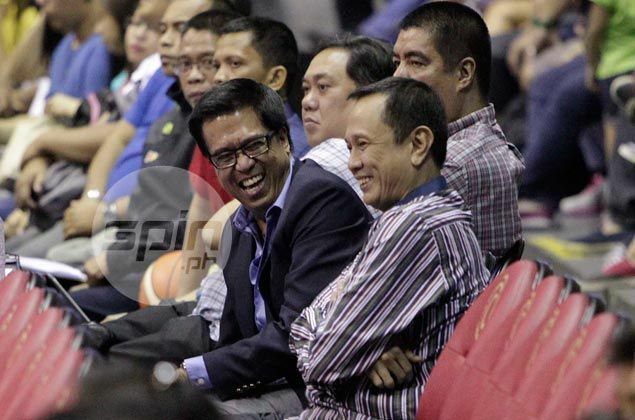 As Narvasa himself said in his letter to Badua, Chua is a “person of authority in our association.” Chua is, in fact, the head of basketball operations of San Miguel Corporation and Ginebra's representative to the league board, vesting him with vast influence not only on the three teams under SMC's umbrella but, more pointedly, on the results of league games. A person with such power and sway, Spin.ph believes, should come under a professional and moral scrutiny more stringent than that levelled on the players themselves, especially since the PBA — with its commercial success over the past 40 years and its large fan base — has become the de facto caretaker of a sport we concede is the national pastime. On Sunday, new PBA president and CEO Chito Salud, in a valiant attempt to pacify the sportswriting community, said the banning issue is not a battle between the PBA and the media, but the PBA’s fight against a single person which it has decreed persona non grata. And just why? Simply because its commissioner, Narvasa - acting as investigator, judge, and executioner - says so. Salud and Narvasa are not being upfront. This PBA ban is being sold as an action against one person, yet there is no way this ban can be taken in isolation. It is being marketed as the league’s righteous anger against one website, yet this ban cannot, in whole or in part, be justifiable in a country and a time when press freedom has long been fought and won. This ban sets a bad precedent. It delivers a threat to all media persons, whether from the print, broadcast, or digital platform, who write and comment about the league, its officials, its corporate participants, its teams, its players, its coaches, and its games. Add to that: "We did it once, we can do it again." At its core, this PBA ban sends a chilling warning to hundreds of journalists not to be the next person that Narvasa may decide has an “evil mind." We've said many times that, in the age of social media, the media landscape has evolved in so many new ways, including that of the lines between journalists' official comments and their online opinions blurring. In the case of Badua's tweets, the PBA, and Chua himself, could simply have knocked down Badua's tweet in any of the wide selection of media platforms at their disposal, or pursued options available to them under the law. But by going the route of banning Badua from the league's games and all its activities, and threatening to punish every single player, coach, or team official that dares talk to him, the PBA taps into its undue power, violates the rights of a free press, threatens a man's practice of his livelihood, and curtails the readers' right to know. Badua is a legitimate journalist, who also happens to be active on social media, like dozens of other journalists from various platforms and outlets who, by now, have been sufficiently warned that they face a similar ban should they make the mistake of writing something that the league and its officials may not like. Is this a threat to press freedom? Remember only that from one seemingly isolated and wrongful action comes the foundation of a dangerous and far more devastating offense. But as divisive an issue as this has become between the PBA and the press, there is an odd new feature emerging from it. The often-divided league board has, for once, agreed on something! Even if it is only the spurious act of allowing Narvasa to hand down a ban on a writer who has, in his mind, done harm to Chua, his close and important friend. We can only hope that the league be as united and decisive in acting on matters of greater import to the country, such as its shaky and unfriendly position on the Gilas Pilipinas national team, one that runs contrary to Salud’s constant assurances.